Virtual currencies (Coins, Gold, Gems, etc.) are used in games across genres and platforms. Players buy these currencies with real money. Players usually don't spend all of the virtual currency. When they want to play a new game, they have to abandon their winnings and start again from scratch. This leaves millions of dollars frozen inside games, every day! 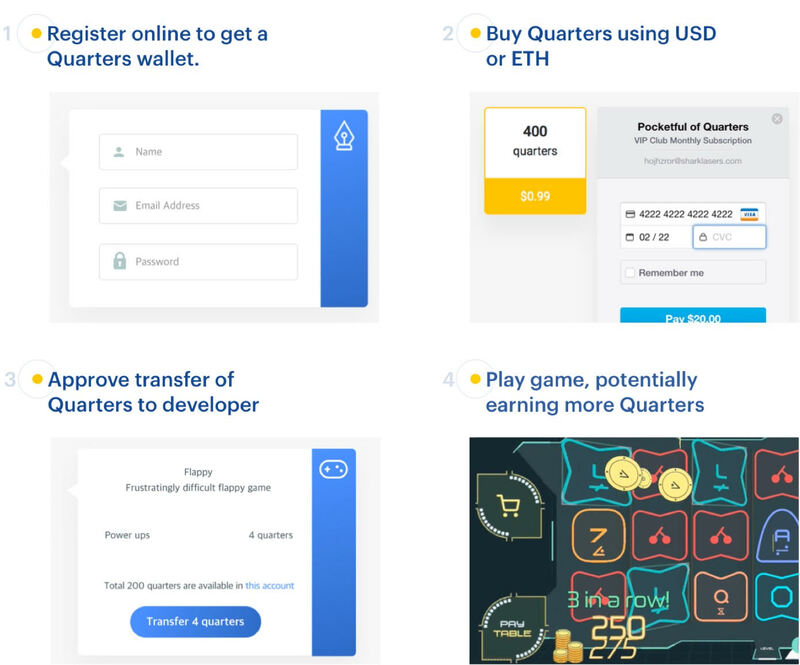 Quarters are the universal virtual currency for gaming, usable across different games and platforms. Players have a single wallet with Quarters. When they start playing a new game, they can transfer Quarter coins to that game. When they don’t want to play that game any more, they can transfer Quarters back to their wallet, and use them in other games. Quarters are designed specifically for playing games and not for storing value. Like classic arcade tokens (i.e. Chuck E Cheese), you can buy Quarters but you can’t redeem them outside of the gaming ecosystem. You are investing in Q2 tokens, which pay you royalties on the sales of Quarters tokens, not the gaming-centered Quarters tokens. See “Token Economics” for more info. Game developers compete to collect Quarters from game players. Players transfer Quarters to developers in order to play games. In turn, developers (but not players) exchange Quarters for Ether, based on a formula set in the smart contract. Quarters can incentivize game adoption. Players get free Quarters when they sign up, and whenever the number of Quarters sold doubles. Free Quarters are a fun reward for everyone in the Quarters ecosystem. For further detail on the Quarters ecosystem, you can read the Quarters Whitepaper. 1. We’ve launched Quarters and the portal, pocketfulofquarters.com — tokens are already available for purchase by players with an email address and a credit card — it's that easy! 3. Technology partnership with Matic.network to enable us to scale Quarters transactions without creating congestion on the Ethereum mainnet or incurring excessive fees. 4. Distribution partnerships with influencers via Rise9 (www.rise9app.com). Rise9 influencers have over 700,000,000 followers in their community. 5. 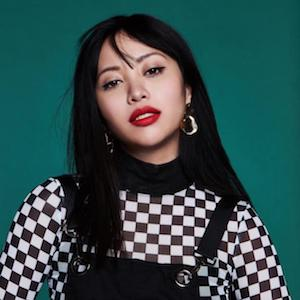 Raised $400,000 from leading media figures and investors including Michelle Phan, Ugur Koyoglu and other angel investors in a SAFE note and in a private pre-sale of Q2 tokens (same tokens you are investing in). An early pioneer on YouTube with over 1 billion views. Founder of Ipsy, which is valued at $1B and has over 3,000,000 paid subscribers for its beauty and wellness products. Revenue from video games is about seven times (7x) bigger than movies and music combined. One in seven people play video games globally, which is about 1.2B people. 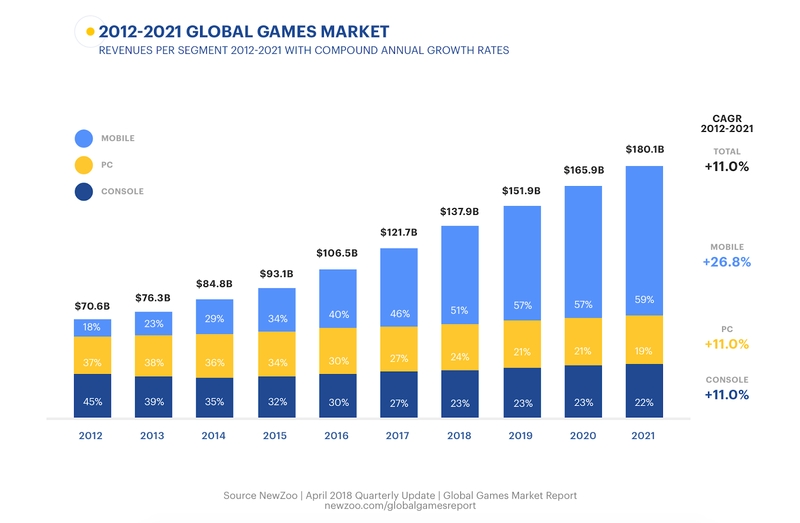 Video games are a $138B market, growing rapidly (>10% per year). Quarters are intended to be the first gaming token desired by players, distributed directly to players, that has a stable value and works across platforms. Meanwhile, traditional in-game currencies are stuck in each game. Other gaming cryptocurrencies that we are aware of have fixed token supplies with fluctuating values. We’re on track to launch the Quarters Beta by December 2018. Our version 1 was a success: we’ve collected a lot of valuable customer feedback and implemented it into an upcoming v.2, which we plan to launch at the end of 2018. This fall, we will open up a waitlist, and let some players and their friends test our first games. Gaming influencers will play the games to get players excited about Quarters. Then we will launch the Beta to the public for mid-December 2018. We have an amazing team backing George and his vision. This award-winning team has decades of experience in the gaming and technology industry. When you investing in this deal, you’re investing in Q2 tokens, not Quarters tokens. Quarters (symbol:Q) are a token designed for game use only. They’re available for sale on PocketfulOfQuarters.com, can be earned as rewards for participating, and - by design - cannot be sold back for financial gain. Players can use Quarters to play games within our ecosystem. Game developers compete to collect Quarters from game players. Players transfer Quarters to developers in order to play games. In turn, developers (but not players) exchange Quarters for Ether, based on a formula set in the smart contract. Q2 (symbol: Q2) are revenue-sharing tokens, designed to attract the initial investment needed to jumpstart the Quarters ecosystem. Q2 tokens are royalty tokens that distribute the ETH dividends earned as Quarters are sold. 85% is held in escrow to pay to game developers as players use Quarters in their games. Q2 holders will earn royalties from the sale of Quarters proportional to their ownership of the Q2 network. Investors are offered to invest in POQ Issuer, LLC and receive a Token DPA — a debt instrument, payable by assets (Q2 Tokens). POQ Issuer, LLC is to acquire Q2 Tokens during the planned Jan 2019 Q2 Token Distribution Event. POQ Issuer, LLC is to repay investors (Token DPA holders) with Q2 Tokens with a 20% premium. Please consult the DPA Agreement for complete terms including timing, Republic’s and POQ Issuer’s commission, how funds are handled, what happens with the funds in case the Tokens never get distributed by POQ Issuer, LLC, etc. This debt offering is suitable for sophisticated investors with knowledge of blockchain technology and the ability to assess its applications and their market potentials only. POQ Issuer, LLC is conducting this debt offering, with principal plus 20% interest payable by Tokens (Q2) in lieu of cash, as per the terms of the DPA Agreement. Please carefully review the entire DPA for complete offering terms. POQ Issuer, LLC is a Delaware company and an affiliate of Pocketful of Quarters, Inc., a service company to help promote the adoption of the Quarters ecosystem. Let's make games better for players! Together, we can bring Quarters to games everywhere, and make games better for players. The smallest investment amount that Quarters is accepting. Quarters needs to reach their minimum funding goal before the deadline. If they don’t, all investments will be refunded. If the campaign is successful, you’ll receive a Token DPA for your investment. The DPA is not equity or a token itself, but a loan that payable in tokens in the future, with interest. The amount of time Quarters has to pay out your investment in tokens. If the DPA isn't repaid with tokens after that time, it will be payable in cash with interest. The interest amount that will accumulate on your investment if it’s paid back to you in cash. The interest amount that will accumulate on your investment if it’s paid back to you in tokens. How much you can get back of your investment if you choose to cancel the Token DPA before it’s paid back. Quarters needs to raise $100K before the deadline. The maximum amount Quarters is willing to raise is $1.07M. Early access to one game that accepts Quarters and also receive 50,000 Free Quarters! Early access to one game that accepts Quarters for you and five other friends, and also receive 240,000 Free Quarters over 12 months! An invitation-only streaming session with George and also receive 20,000 Free Quarters! Get early access to all available Quarters games in our beta program and also receive 20,000 Free Quarters! Play on stream with George (one on one for an hour!) and also receive 20,000 Free Quarters! Early access to all Quarters games in the beta program for you and 10 other friends, and also receive 20,000 Free Quarters! Design a mobile game with Chris Cross and also receive 20,000 Free Quarters! Meet George in person in NYC and also receive 20,000 Free Quarters! George is a sixth grader at Greenwich Country Day School, in Connecticut. He is a regular speaker about cryptocurrencies and games, and he has appeared in Marketwatch, ICO Investor TV, Be Inspired, and The New York Post. Mike is a VC at Rostrum Capital, and the founder of E-thePeople (merged with League of Women Voters), Tip or Skip and Endless TV. He has a degree in Computer Science from Princeton University and Ph.D. from Stanford University. Michelle is an early pioneer of YouTube, earning over 1 billion views. In 2011, she co-founded Ipsy, a subscription e-commerce business that raised over $100M, with 3,000,000 monthly paying subscribers. Chris has lead teams at AAA studios including Blizzard Entertainment, THQ, EA, and DreamWorks. Chris has designed and directed games (notably Medal of Honor) that have been played by over 300M players and earned $6+ billion in revenue. 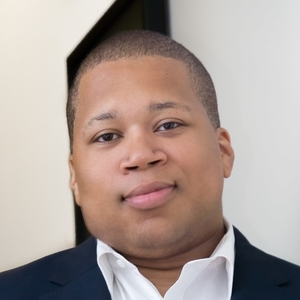 Devo is founder & CEO of Adventr. He won three Grammy's for his work with Kanye West and John Legend and has collaborated with Britney Spears, Nas, Aretha Franklin and Barack Obama. He earned degrees from Wharton and Columbia Business School. 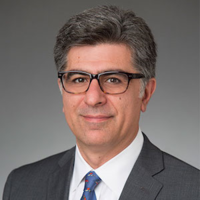 Ugur is currently Vice Chairman at Oliver Wyman. Ugur has a PhD in Engineering from Princeton University, and Turkey’s Koc University. 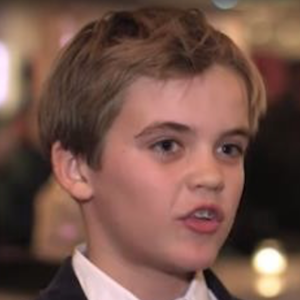 George Weiksner, the 11-year-old CEO of Pocketful of Quarters, is creating a cryptocurrency for online gaming platforms. Why are Quarters better than USD for games? Generally, players don't directly purchase in-game assets. Instead, players buy packages of in-game coins (or gems, etc.) with USD, and then use these coins to make purchases. Quarters replaces these in-game coins. Like in-game coins, players can buy Quarters with USD . Unlike traditional in-game coins, Quarters can be used within the original game as well as any other participating Quarters game. How are you going to acquire players? We will acquire users in two ways. The first way is with a waiting list with tasks and rewards. The second way will with influencers. Influencers will play our games and their viewers will be intrigued by the games and want to learn more. How do game developers make money from using Quarters in their games? Two ways. First, reduced marketing costs, by accessing player who have already bought Quarters. Second, increased revenue, because we’ve removed friction for micropayments within your game by moving the paywall outside of your game. Why would a developer want to earn a new currency Quarters? To earn ETH. Approved developers can exchange Quarters for ETH. ETH is valuable! Ethereum is a terrific cryptocurrency loved by developers and investors, and is easily traded on all major exchanges for fiat money like USD or for any cryptocurrency use. Large developers want to trap players in their games -- why would they adopt Quarters? Why would developers give up abandoned money? To earn more money! Large developers can earn money when players use Quarters in games by small developers. When you go to the arcade to play Ms Pacman, you may drop a few credits in Missile Command on the way out. Missile Command only makes money because Ms Pacman got you to walk in and open your wallet. So Missile Command should and will subsidize Ms Pacman. Is Quarters is too customer positive to work in the mobile games industry? Being pro-player is pro-video game industry, period. Have you been accepted into the Apple App Store and Google Play Store? We’ve been accepted! We worked with Apple over this past summer, and developed a solution that lets you buy Quarters in the Apple App Store and Google Play Store and bring your Quarters from other games into your apps. We will release these games as part of our closed beta in 2019. What game companies have adopted this universal gaming coin? Stay tuned, TBA. We’re going to have some great games. We already have a universal currency -- the USD. Why do we need Quarters? We need Quarters because you can't gamble or bet with USD which is fun and can be enabled with Quarters because you can't sell them for money. With Quarters, we only have *simulated* gambling. Why not use another gaming currency that already exist in the app store? The issue there is that you can only use them in that one game, while you can use Quarters in any game. What’s the point? I never overspend and I never get paid. Yeah, me neither :) But my friends tell me they’ve experienced issues with wasted coins. For example, you have to buy 1,000 V-bucks and to buy a Fortnite skin that costs 800 V-bucks. If you bought Quarters instead, you would be able to spend those leftover coins in another game. I hate microtransaction -- won’t Quarters make video games worse? A universal game token like Quarters can make games both *more fun* and waste *less time* from players. Do you view the emerging backlash against in game "loot boxes" as a risk to your business? The short answer is; No, the backlash against loot boxes won't affect Quarters. We are a player first built gaming token, the use of loot boxes is an issue we wish to fix via quarters. Quarters are the first coin available that allows you to take your unspent coins in games any game. Loot boxes are a monetization tactic used to confuse in order to build retention. It is a play for whales rather than the average player. Preying on those with addictive personalities and collective habits will not change. However, Quarters will free you from being bound to a single game because you have spent X amount of dollars. Quarters allows those dollars to move freely through the gaming ecosystem. How do I get my Free Quarters perk? We will send you a message via Republic with a one-time promo code when we launch early 2019. I’m interested in hear more about the Q2 royalties. So if i invest i get actual royalties? how and when are they paid out? and for how long? thanks! There are 15% of the royalties when a Quarter is bought goes to the Q2 contract were they are divided to the owners of Q2's evenly per Q2. You can pay out whenever you want but you are forced to pay out whenever you sell a Q2. There’s a 12 year old CEO. Is this for real? Do I get equity if I invest? No, you get the right to have your DPA repaid in Q2 royalty tokens. What’s the difference between Quarters and Q2 tokens? Quarters are a consumer product that you can be used to play games only. Q2 tokens are a security token that distributes royalties to investors. On Republic, anyone over 18 can invest as little as $25 in Q2 tokens. How do I get my Q2 tokens from my investment? How can I learn more about Quarters and Q2s? Also jump in a chat with our team at www.pocketfulofquarters.com! Can I see a demo of how Quarters works? Tim Draper: Okay, let's bring on our first entrepreneur, but first let's see what's happening behind the scenes. 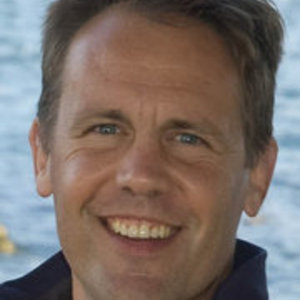 George: Hi, I'm George Weiksner, and the co founder and CEO of Invest In Quarters. At Invest In Quarters, we try to make gaming better for players. It started when my dad was telling me about cryptocurrency when I was coming home from school. At the time I was frustrated because whenever I quit a game, I'd lose the coins, and the coins are stuck in that game. There's not many young entrepreneurs, but I think that anyone can make a company or solve their problem if they really put their mind to it. I'm just most excited about getting our idea out there, and getting some more players, and just people who wanna get involved. I'm really excited to get to meet the Drapers, and I hope that this will really help Quarters get off the ground even more. Tim Draper: Welcome to Meet the Drapers, give us your pitch. George: I was frustrated whenever I quit a game, 'cause that meant I lost all my coins, hard work, time and effort. With Quarters, you'll be able to use one coin in all your games. We have a great team, and have raised $350,000 in our presale. Our mission is to make gaming better for players. Join us, and make this a reality. Tim Draper: Terrific. So tell me how this works. How do I get Quarters? George: So Quarters, you can buy four quarters for a dollar, and then these quarters can be used online in any game on our platform. Tim Draper: So it's just, hey, I put down a dollar, I get four quarters, I can now use those quarters to go play video games online? George: Yep. And also, we're planning to do some casual eSports, so you can anti how many quarters you want to bet in the way in that game. Tim Draper: To bet against each other when you're playing? Sonny Singh: So is this sort of a digital currency you're paying? Sonny Singh: So in game purchasing, essentially. Sonny Singh: Let's take a step back, how old are you, actually? Sonny Singh: What am I ... 'Cause [crosstalk 00:07:35] what's going on? Tim Draper: How old is he? George: Sure. I'm 12, and I'm going into 7th grade at Greenwich Country Day. Polly Draper: 12 year old from Connecticut. Tim Draper: Good school that got you doing this. George: The Winklevoss twins went there, George H. W. Bush went there, Donovan Mitchell who is a rookie of the year contendant in basketball went there. Tim Draper: Actually, the Winklevoss twins are the ones where my eyebrows went, "What?" Sonny Singh: I hope they're a part of your presale. George: Yeah, Michelle Phan invested, also Chris Cross who's been a game designer for three billion dollar gaming franchises, Call of Duty, World of Warcraft, and God of War. Bill Draper: Is there somebody with you on your team? Polly Draper: That's over 12. Sonny Singh: In the teens. George: Yeah, so the two people I just mentioned are advisors, and Michelle is an investor. My dad, the CTO. Sonny Singh: What's your dad's background, is he in this? George: My dad is a venture capitalist in hedge fund. Tim Draper: How is it having your dad work for you? I've got him doing the same thing. My dad works for me, too. He works pretty well, right? Tim Draper: They do a lot of work and they just you know, they don't expect too much. Bill Draper: [crosstalk 00:08:48] get paid. Tim Draper: You just got paid. Polly Draper: Yeah. In [crosstalk 00:08:52] dollar bills. Tim Draper: Who wrote the code? George: My dad, and we use a side chain that's created by a man who actually lives in India named Jianti. Sonny Singh: And as you know, digital currency for the video game space is very big, especially eSports gaming. And an investor in Unikrn UKG, which is backed by Mark Cuban for eSports gaming, there is WAX which is OPSkins, has their own token, too, for the Steam platform and all that. How do you see yourself fitting into all that, 'cause there's so many now doing this, actually. It's a great fit. George: Most of these other currencies are either developed, focused, or like you said more eSports focused. We're the universal gaming token that's player focused, so our goal is to make gaming better for players. Tim Draper: Is it working now? Tim Draper: Can I go buy some quarters and start playing games? George: So the smart contracts are launched, we're not planning to fully launch for a month or two. Sonny Singh: Wait, when you looked at tokens though, did you think about using a bitcoin token, or Ethereum based one using a side chain? What made you decide which one? George: So we're basing ours off ERC-20. Sonny Singh: Oh, you are using ERC-20, okay. George: So if the price of quarters was to fluctuate, that would make it to people would be holding on to it, and them some of the gaming currencies more of an investing currency. So quarters are always 25 cents, and they can't sell them back as a player, so then you use anting and stuff like that. Bill Draper: Was this originally your idea? George: Yeah. So my dad, we were coming home from school, he was explaining to me cryptocurrency. And then I was frustrated, 'cause whenever I quit a game, I'd lose all my coins. So then we created this. It started off as a hobby, and it took off on when we went to a crypto meetup and we got interviewed, and then Michelle Phan, Chris Cross and Devo Harris, who's a three time Grammy Award winner, also reached out to us. And yeah, it's just blown up. 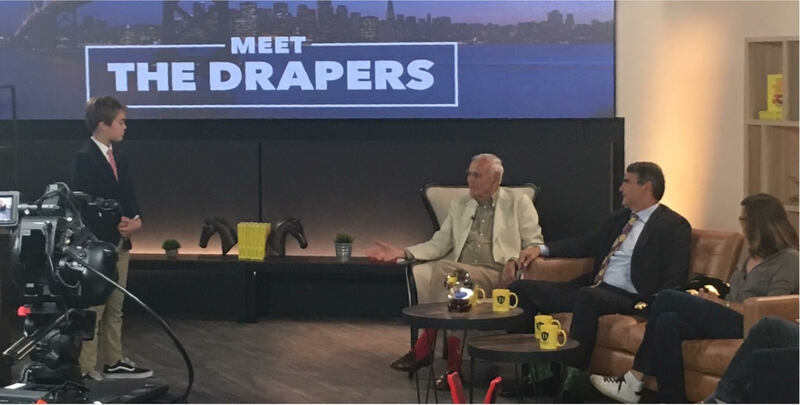 Tim Draper: And then you got to be on Meet the Drapers. George: I know, it's great. Sonny Singh: I agree with that. Bill Draper: Best salesman we've seen all day. Sonny Singh: 7th grade coming up, that's a big year. You can't miss it. George: Yeah. It's working really well 'cause I'm really good with my homework management. George: The most homework I've come out with from school, you can ask my dad if you don't believe me. Polly Draper: I believe you. George: Is ten minutes, because I just do it all during study halls. Tim Draper: Are you better in math or english? Tim Draper: Not surprised. Do you play any sports? George: Yeah, I play football, tennis, skiing, I run. Tim Draper: Well what about eSports, do you play any eSports? Tim Draper: Do you watch eSports? Yeah. So you go to Twitch. George: Yeah, I've got a Twitch account. Polly Draper: Wait, what does that mean, Twitch? Sonny Singh: You watch people play. Tim Draper: Well you've gotta watch Twitch TV, and they can watch people play video games. Sonny Singh: Polly, you'd love it. You just watch people play video games. Tim Draper: And you stream? Tim Draper: Oh, so you're a part, oh my gosh. Sonny Singh: So he's big time. Tim Draper: You've got a lot of great things going on. Sonny Singh: All the platforms. Tim Draper: You're on to a great, successful career. Bill Draper: We're all gonna vote thumbs up. Tim Draper: I am very excited for this. Hey, don't- we'll have to consult the crystal ball. Bill Draper: That's true. And your parents here? George: Yeah, my dad's over there. Bill Draper: Hey, not bad. Tim Draper: Hey, come on down here. Tim Draper: Come on out here. Bill Draper: He didn't dress very well, compared to you, much better image. Speaker 11: I'm not even supposed to be here. Sonny Singh: Company dress code. Tim Draper: What's it like working for your son? Speaker 11: He's great. He sees things really clearly. So it's terrific. Tim Draper: Has he threatened to fire you? Speaker 11: Within the sort of bed time for our more coins sort of conversation. Tim Draper: This is gonna be great. You're gonna learn a lot, and you're gonna make a fortune, I think. In quarters. And all those quarters, what are you gonna do with all those quarters? Tim Draper: Terrific. Thank you both. Thank you so much for coming on to Meet the Drapers. Oh my gosh, the handshake is unbelievable. George: Very surprising, I can play kind of the cute game for a second, and then they started a lot of good questions. Bill even went to say that they are gonna give me thumbs up. What more could you ask for? Maybe I smiled a little bit too much if that's possible. Speaker 12: Is that how it normally goes in your interviews? George: Yeah. To be honest, yeah. 90% of the time. Unless they are you know, [inaudible 00:13:33] I don't usually do that. I hope I'm the next Tim Draper, 'cause he's really successful. Tim Draper, watch out, I'm coming for you. Tim Draper: So, now let's see what we all thought of Quarters. Before we do that, I just wanna ask each of you, what did you sell when you were 12? Bill Draper: Bobby Frick, my next door neighbor and I, decided we would sell horse chestnuts. And I collected all, a big box full of horse chestnuts, and we went and sold them thinking they were edible. And we said, "And these are great chestnuts, we sell them for $1 a dozen." And some people would buy, but very few. Tim Draper: Well I sold apples. We had an apple tree, and I picked all the apples, and I brought them to the end of the driveway. I sat out there for, pretty much I thought, the entire summer. And at the very end our next door neighbor's mother came over and said, "So how much did you make?" And I went, "$8." This was the whole summer. She said, "Well, who helped you?" I said, "Well, once in a while this guy came over, and once in a while somebody else, and somebody else," and she said, "Okay." And she took the $8. She gave one to each of them. Tim Draper: And gave one to me, and took two for herself. Tim Draper: I realized that that was my first experience with socialism. Polly Draper: Oh my gosh. Tim Draper: Now it's Sonny's turn, what about you? Sonny Singh: In 7th grade I was 12 years old, and I was trying to sell KitKats 'cause we had them lying around the house, the little chocolate bar. So I'd take a bunch of them to school and sell them for like 25 cents, 'cause there was no margin cost. The problem was, I ended up eating 90% of them actually. So then I would start buying them, but then I started eating more, and I ended up losing money and the whole thing fell apart within a couple days. Bill Draper: But gained weight. Sonny Singh: Yes. So about four days of trying, it didn't work out. I'm still trying to have a successful business, it's been a lot of failure so far. Tim Draper: Yeah. Polly, how about you? Polly Draper: My sister, also your sister, and I created a summer camp for kids. Tim Draper: Oh, I remember that. Polly Draper: We just heard recently from one of the girls that that was one the high points of her childhood, was coming to our summer camp where Becky and I were like, "What are we gonna do with them today? Throw 'em in the pool, it's okay." Tim Draper: Anyway, this was a 12 year old that blows us all away. Polly Draper: Yeah, that's the point. Tim Draper: I think we're just gonna vote. Tim Draper: Okay. Thumbs up, thumbs down, thumbs all around. Boom. Tim Draper: Whoa. You flew us away. Polly Draper: He really did. Tim Draper: Eight thumbs. That's a record. A record number of thumbs here on Meet the Drapers. Okay, let's bring on the next entrepreneur, but before we do, let's see what's happening behind the scenes. We are a startup company and our business modelÕs current focus is on market adoption by players and game developers rather than generating revenue. While we intend to generate revenue in the future, we cannot assure you when or if we will be able to do so. We rely on external financing to fund our operations. We anticipate, based on our current proposed plans and assumptions relating to our operations (including the timetable of, and costs associated with, new product development) that, if the Minimum Amount is raised in this Offering, it will be sufficient to satisfy our contemplated cash requirements through approximately January 31, 2019, assuming that we do not accelerate the development of other opportunities available to us, engage in an extraordinary transaction or otherwise face unexpected events, costs or contingencies, any of which could affect our cash requirements. We expect capital outlays and operating expenditures to increase over the next several years as we expand our infrastructure, commercial operations, development activities and establish offices. Our future funding requirements will depend on many factors, including but not limited to the following: ¥ The cost of expanding our operations; ¥ The financial terms and timing of any collaborations, licensing or other arrangements into which we may enter; ¥ The rate of progress and cost of development activities; ¥ The need to respond to technological changes and increased competition; ¥ The costs of filing, prosecuting, defending and enforcing any patent claims and other intellectual property rights; ¥ The cost and delays in product development that may result from changes in regulatory requirements applicable to our products; ¥ Sales and marketing efforts to bring these new product candidates to market; ¥ Unforeseen difficulties in establishing and maintaining an effective sales and distribution network; and ¥ Lack of demand for and market acceptance of our products and technologies. We may have difficulty obtaining additional funding and we cannot assure you that additional capital will be available to us when needed, if at all, or if available, will be obtained on terms acceptable to us. If we raise additional funds by issuing additional debt securities, such debt instruments may provide for rights, preferences or privileges senior to the Securities. In addition, the terms of the debt securities issued could impose significant restrictions on our operations. 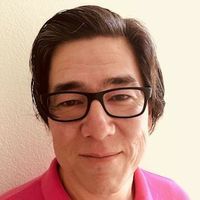 If we raise additional funds through collaborations and licensing arrangements, we might be required to relinquish significant rights to our technologies or product candidates or grant licenses on terms that are not favorable to us. If adequate funds are not available, we may have to delay, scale back, or eliminate some of our operations or our research development and commercialization activities. Under these circumstances, if the Company is unable to acquire additional capital or is required to raise it on terms that are less satisfactory than desired, it may have a material adverse effect on its financial condition. We have no operating history upon which you can evaluate our performance, and accordingly, our prospects must be considered in light of the risks that any new company encounters. We were organized under the laws of Delaware on May 8, 2018. Accordingly, we have no history upon which an evaluation of our prospects and future performance can be made. Our proposed operations are subject to all business risks associated with new enterprises. The likelihood of our creation of a viable business must be considered in light of the problems, expenses, difficulties, complications, and delays frequently encountered in connection with the inception of a business, operation in a competitive industry, and the continued development of advertising, promotions, and a corresponding client base. We anticipate that our operating expenses will increase for the near future. There can be no assurances that we will ever operate profitably. You should consider the CompanyÕs business, operations and prospects in light of the risks, expenses and challenges faced as an early-stage company. We may have difficulty raising needed capital in the future as a result of, among other factors, our underage CEO, our lack of an approved product and revenues from sales, as well as the inherent business risks associated with our company and present and future market conditions. Our business currently does not generate any sales and future sources of revenue may not be sufficient to meet our future capital requirements. We will require additional funds to execute our business strategy and conduct our operations. If adequate funds are unavailable, we may be required to delay, reduce the scope of or eliminate one or more of our efforts to encourage adoption of Quarters by players and game developers, any of which may materially harm our business, financial condition and results of operations. Our management team has limited experience in the video game industry and has not managed a business with similar risks and challenges specific to our business. Members of our management team, some of whom are underage, may make decisions detrimental to our business and/or be unable to successfully manage our operations. The ineffective management of our business will have a negative effect on our results of operations. The development and commercialization of cryptocurrencies for video games is highly competitive. We face competition with respect to our current products and any products that we may seek to develop or commercialize in the future. Our competitors include major companies worldwide. Many of our competitors have significantly greater financial, technical and human resources than we have and superior expertise in research and development and marketing approved video game development and publishing and thus may be better equipped than us to develop and commercialize video games. These competitors also compete with us in recruiting and retaining qualified personnel and acquiring technologies. Smaller or early stage companies may also prove to be significant competitors, particularly through collaborative arrangements with large and established companies. Accordingly, our competitors may commercialize products more rapidly or effectively than we are able to, which would adversely affect our competitive position, the likelihood that our video game currency will achieve initial market acceptance and our ability to generate meaningful additional revenues from our products. We depend on third-party service providers and we outsource a number of our non-core functions and operations. We obtain these materials from a limited number of vendors, some of which do not have a long operating history or which may not be able to continue to supply the equipment and services we desire. Some of our hardware, software and operational support vendors represent our sole source of supply or have, either through contract or as a result of intellectual property rights, a position of some exclusivity. If demand exceeds these vendorsÕ capacity or if these vendors experience operating or financial difficulties or are otherwise unable to provide the equipment or services we need in a timely manner, at our specifications and at reasonable prices, our ability to provide some services might be materially adversely affected, or the need to procure or develop alternative sources of the affected materials or services might delay our ability to serve our customers. These events could materially and adversely affect our ability to retain and attract customers, and have a material negative impact on our operations, business, financial results and financial condition. As a distributor of a gaming cryptocurrency, our business depends on developing and maintaining close and productive relationships with our game developer vendors. We depend on our vendors to sell us quality products at favorable prices. Many factors outside our control, including, without limitation, raw material shortages, inadequate manufacturing capacity, labor disputes, transportation disruptions or weather conditions, could adversely affect our vendorsÕ ability to deliver to us quality games at favorable prices in a timely manner. Furthermore, financial or operational difficulties with a particular vendor could cause that vendor to increase the cost of the products or decrease the quality of the products we purchase from it. Vendor consolidation could also limit the number of suppliers from which we may purchase products and could materially affect the prices we pay for these products. We would suffer an adverse impact if our vendors limit or cancel the return privileges that currently protect us from inventory obsolescence. Costs associated with information security Ð such as investment in technology, the costs of compliance with consumer protection laws and costs resulting from consumer fraud Ð could cause our business and results of operations to suffer materially. Additionally, the success of our online operations depends upon the secure transmission of confidential information over public networks, including the use of cashless payments. The intentional or negligent actions of employees, business associates or third parties may undermine our security measures. As a result, unauthorized parties may obtain access to our data systems and misappropriate confidential data. There can be no assurance that advances in computer capabilities, new discoveries in the field of cryptography or other developments will prevent the compromise of our customer transaction processing capabilities and personal data. If any such compromise of our security or the security of information residing with our business associates or third parties were to occur, it could have a material adverse effect on our reputation, operating results and financial condition. Any compromise of our data security may materially increase the costs we incur to protect against such breaches and could subject us to additional legal risk. Through our operations, we collect and store certain personal information that our customers provide to purchase products or services, enroll in promotional programs, register on our web site, or otherwise communicate and interact with us. We may share information about such persons with vendors that assist with certain aspects of our business. Security could be compromised and confidential customer or business information misappropriated. Loss of customer or business information could disrupt our operations, damage our reputation, and expose us to claims from customers, financial institutions, payment card associations and other persons, any of which could have an adverse effect on our business, financial condition and results of operations. In addition, compliance with tougher privacy and information security laws and standards may result in significant expense due to increased investment in technology and the development of new operational processes. We collect and store sensitive data, including intellectual property, our proprietary business information and that of our customers, suppliers and business partners, and personally identifiable information of our customers and employees, in our data centers and on our networks. The secure processing, maintenance and transmission of this information is critical to our operations. Despite our security measures, our information technology and infrastructure may be vulnerable to attacks by hackers or breached due to employee error, malfeasance or other disruptions. Any such breach could compromise our networks and the information stored there could be accessed, publicly disclosed, lost or stolen. Any such access, disclosure or other loss of information could result in legal claims or proceedings, liability under laws that protect the privacy of personal information, and regulatory penalties, disrupt our operations and the services we provide to customers, damage our reputation, and cause a loss of confidence in our products and services, which could adversely affect our business/operating margins, revenues and competitive position. Such an event might be caused by computer hacking, computer viruses, worms and other destructive or disruptive software, Òcyber attacksÓ and other malicious activity, as well as natural disasters, power outages, terrorist attacks and similar events. Such events could have an adverse impact on us and our customers, including degradation of service, service disruption, excessive call volume to call centers and damage to our plant, equipment and data. In addition, our future results could be adversely affected due to the theft, destruction, loss, misappropriation or release of confidential customer data or intellectual property. Operational or business delays may result from the disruption of network or information systems and the subsequent remediation activities. Moreover, these events may create negative publicity resulting in reputation or brand damage with customers. In particular, the Company is dependent on G. Michael Weiksner, the Manager of POQ Manager, the Manager of the Company, to carry out the business plan of the Company. The Company has or intends to enter into an employment agreement with G. Michael Weiksner although there can be no assurance that it will do so or that he will continue to be employed by the Company for a particular period of time. The loss of G. Michael Weiksner or any member of the board of directors or its executive officers could harm the CompanyÕs business, financial condition, cash flow and results of operations. The Company is dependent on G. Michael Weiksner and George Weiksner in order to conduct its operations and execute its business plan, however, the Company has not purchased any insurance policies with respect to either G. Michael Weiksner or George Weiksner in the event of either of their death or disability. Therefore, if either G. Michael Weiksner or George Weiksner dies or become disabled, the Company will not receive any compensation to assist with their absence. The loss of such persons could negatively affect the Company and its operations. Therefore, you have no audited financial information regarding the CompanyÕs capitalization or assets or liabilities on which to make your investment decision. If you feel the information provided is insufficient, you should not invest in the Company. We are subject to income taxes as well as non-income-based taxes, such as payroll, sales, use, value-added, net worth, property and goods and services taxes, in the U.S. The United States tax rules applicable to an investment in the Securities and the underlying tokens are uncertain and the tax consequences to an investor of an investment in the Securities could differ from the investorÕs expectations. The tax rules applicable to the Securities and the underlying tokens held by the Company are complex, and no statutory, judicial, or administrative authority directly addresses the characterization of an investment in tokens. The tax consequences to a Purchaser of the Securities could differ from the PurchaserÕs expectations. Purchasers should consult their own tax advisors. Regulatory changes or actions may alter the nature of an investment in the Securities or restrict the use of tokens or the operation of the network in a manner that adversely affects an investment in the Securities. As cryptocurrencies and tokens have grown in popularity and in market size, the U.S. Congress and certain U.S. agencies (e.g., FinCEN, the Securities and Exchange Commission and the Federal Bureau of Investigation) have begun to examine the operations of the cryptocurrency and token networks and issuers. Local state regulators such as the California Department of Financial Institutions and the New York State Department of Financial Services have also initiated examinations of cryptocurrencies. There is a possibility of future regulatory change altering, perhaps to a material extent, the nature of an investment in the Securities or the ability of the Company to continue to operate. To the extent that cryptocurrencies or tokens are determined to be a security, commodity future or other regulated asset, or to the extent that a U.S. or foreign government or quasi-governmental agency exerts regulatory authority over cryptocurrency or token trading and ownership, trading or ownership in the Securities may be adversely affected. To the extent that future regulatory actions or policies limit the ability to exchange cryptocurrencies or utilize them for payments, the demand for cryptocurrency will decrease. New regulations may make it more difficult to acquire and/or use cryptocurrencies. Furthermore, regulatory actions may limit the ability of end-users to convert cryptocurrencies into fiat currency (e.g., U.S. Dollars) or use cryptocurrencies to pay for goods and services. Such regulatory actions or policies would negatively affect our business and decrease the value of the Securities. Cryptocurrencies currently face an uncertain regulatory landscape in not only the United States but also in many foreign jurisdictions such as the European Union. While the German Ministry of Finance has declared Bitcoin to be ÒRechnungseinheitenÓ (a form of private money that is recognized as a unit of account, but not recognized in the same manner as fiat currency), most regulatory bodies have not yet issued official statements regarding intention to regulate or determinations on regulation of other cryptocurrencies. Conversely, regulatory bodies in some countries such as Canada and India have declined to exercise regulatory authority when afforded the opportunity. Various foreign jurisdictions may, in the near future, adopt laws, regulations or directives that affect cryptocurrencies, particularly exchanges and service providers that fall within such jurisdictionsÕ regulatory scope. Such laws, regulations or directives may conflict with those of the United States and may negatively impact the acceptance of cryptocurrencies by users, merchants and service providers outside of the United States and may therefore impede the growth of the cryptocurrency economy. We are not able to predict the effect of any future regulatory change on the Company or cryptocurrencies, but such change could be substantial and adverse to the Company or the value of the Securities. It may be illegal now, or in the future, to acquire, own, hold, sell or use tokens in one or more countries. Although currently tokens are not regulated or are lightly regulated in most countries, including the United States, one or more countries may take regulatory actions in the future that severely restricts the right to acquire, own, hold, sell or use tokens or to exchange tokens for fiat currency. Such an action may also result in the restriction of ownership, holding or trading in the Securities. Such a restriction could result in the termination and liquidation of the Company at a time that is disadvantageous to Purchasers. To the extent that the activities of the Company cause it to be deemed a Òmoney transmitterÓ under the regulations promulgated by FinCEN under the authority of the U.S. Bank Secrecy Act, or by any state, the Company may be required to comply with FinCEN and state regulations, including those that would mandate the Company to implement anti-money laundering programs, make certain reports to FinCEN and maintain certain records. Such additional regulatory obligations may cause the Company to incur extraordinary expenses or reduce efficiencies necessary for the visibility of the token, possibly affecting an investment in the Securities in a material and adverse manner. The video game industry is subject to extensive legislation and regulation at the federal and state levels. Additionally, our Quarters for games are also subject to regulation, and additional regulation is under consideration. Many aspects of such regulation are currently the subject of judicial and administrative proceedings, legislative and administrative proposals, and lobbying efforts by us and our competitors. Legislation under consideration could entirely rewrite our principal regulatory statute, and the U.S. Federal Communications Commission (ÒFCCÓ) and/or Congress may attempt to change the classification of or change the way that our Quarters are regulated and/or change the framework under which broadcast signals are carried, remove the copyright compulsory license and changing rights and obligations of our competitors. We expect that court actions and regulatory proceedings will continue to refine our rights and obligations under applicable federal, state and local laws, which cannot be predicted. Modifications to existing requirements or imposition of new requirements or limitations could have an adverse impact on our business. On 26 February 2015, the FCC ruled in favor of net neutrality by reclassifying Internet broadband access as a telecommunications service and thus applying Title II (common carrier) of the Communications Act of 1934 to Internet service providers. This new classification could slow or halt the adoption of Quarters by players and game developers. Therefore, the FCC ruling and its consequences could adversely affect our business and results of operations. We must successfully adapt to technological advances in the video game industry, including the emergence of alternative gaming platforms. Our ability to exploit new gaming platforms will affect our ability to maintain or grow our business and may increase our capital expenditures. Additionally, we must adapt to changing consumer behavior driven by advances such as online based content delivery, game consoles and mobile gaming. Such changes may impact the revenue we are able to generate from the use of Quarters. If we fail to adapt to emerging technologies, our appeal to our targeted audiences might decline and there would be a materially adverse effect on our business and results of operations. Our business is subject to risks relating to increasing competition for the leisure time and discretionary spending of consumers. We compete with many other sources of entertainment. Technological advancements have increased the number of entertainment choices available to consumers and intensified the challenges posed by consumer fragmentation. The increasing number of entertainment choices available to consumers could negatively impact consumer demand for our products and services. Our failure to effectively anticipate or adapt to new technologies and changes in consumer expectations and behavior could significantly adversely affect our competitive position and its business and results of operations. Our success depends on consumer acceptance of the gaming content we acquire from game developers and we may be adversely affected if the content fails to achieve sufficient consumer acceptance or the costs to create or acquire content increase. We obtain a significant portion of our content from third parties, such as video game developers and publishers and other suppliers. Competition for popular content is intense, and we may have to increase the price we are willing to pay or be outbid by our competitors for popular content. Entering into or renewing contracts for such programming rights or acquiring additional rights may result in significantly increased costs. There can be no assurance that revenue from these contracts will exceed our cost for the rights, as well as the other costs of producing and distributing the content. Furthermore, the CompanyÕs success depends on its ability to consistently acquire and market video games that meet the changing preferences of the broad domestic and international consumer market. We have invested, and will continue to invest, substantial amounts in video game content before learning the extent to which it would earn consumer acceptance. If our content does not achieve sufficient consumer acceptance, or if we cannot obtain or retain rights to popular content on acceptable terms, or at all, our businesses may be adversely affected. A decline in the economic prospects of advertisers or the economy in general could cause current or prospective advertisers to spend less on advertising or spend their advertising dollars in other media. Advertising expenditures also could be negatively affected by (i) increasing audience fragmentation caused by increased availability of alternative forms of leisure and entertainment activities; (ii) the increased use of digital video recorders to skip advertisements; (iii) pressure from public interest groups to reduce or eliminate advertising of certain products; (iv) new laws and regulations that prohibit or restrict certain types of advertisements; and (v) natural disasters, extreme weather, acts of terrorism, political uncertainty or hostilities, because there may be uninterrupted news coverage of such events that disrupts regular ad placement. In addition, advertisersÕ willingness to purchase advertising time from the Company may be adversely affected by a decline in users for our content. We may derive revenue from the sale of advertising, and a decrease in overall advertising expenditures could lead to a reduction in the amount of advertising that companies are willing to purchase and the price at which they purchase it. Expenditures by advertisers tend to be cyclical and have become less predictable in recent years, reflecting domestic and global economic conditions. If the economic prospects of advertisers or current economic conditions worsen, such conditions could alter current or prospective advertisersÕ spending priorities. In particular, advertisers in certain industries that are more susceptible to weakness in domestic and global economic conditions, such as beauty, fashion and retail and food, account for a portion of our advertising revenues, and weakness in these industries could have a disproportionate negative impact on our advertising revenues. Declines in consumer spending on advertisersÕ products due to weak economic conditions could also indirectly negatively impact our advertising revenues, as advertisers may not perceive as much value from advertising if consumers are purchasing fewer of their products or services. As a result, our advertising revenues are less predictable. Technology companies, including many of the CompanyÕs competitors, frequently enter into litigation based on allegations of patent infringement or other violations of intellectual property rights. In addition, patent holding companies seek to monetize patents they have purchased or otherwise obtained. As the Company grows, the intellectual property rights claims against it will likely increase. The Company intends to vigorously defend infringement actions in court and before the U.S. International Trade Commission. The plaintiffs in these actions frequently seek injunctions and substantial damages. Regardless of the scope or validity of such patents or other intellectual property rights, or the merits of any claims by potential or actual litigants, the Company may have to engage in protracted litigation. If the Company is found to infringe one or more patents or other intellectual property rights, regardless of whether it can develop non-infringing technology, it may be required to pay substantial damages or royalties to a third-party, or it may be subject to a temporary or permanent injunction prohibiting the Company from marketing or selling certain products. In certain cases, the Company may consider the desirability of entering into licensing agreements, although no assurance can be given that such licenses can be obtained on acceptable terms or that litigation will not occur. These licenses may also significantly increase the CompanyÕs operating expenses. Regardless of the merit of particular claims, litigation may be expensive, time-consuming, disruptive to the CompanyÕs operations and distracting to management. In recognition of these considerations, the Company may enter into arrangements to settle litigation. If one or more legal matters were resolved against the CompanyÕs consolidated financial statements for that reporting period could be materially adversely affected. Further, such an outcome could result in significant compensatory, punitive or trebled monetary damages, disgorgement of revenue or profits, remedial corporate measures or injunctive relief against the Company that could adversely affect its financial condition and results of operations. To protect our rights in our services and technology, we rely on a combination of copyright and trademark laws, patents, trade secrets, confidentiality agreements with employees and third parties, and protective contractual provisions. We also rely on laws pertaining to trademarks and domain names to protect the value of our corporate brands and reputation. Despite our efforts to protect our proprietary rights, unauthorized parties may copy aspects of our services or technology, obtain and use information, marks, or technology that we regard as proprietary, or otherwise violate or infringe our intellectual property rights. In addition, it is possible that others could independently develop substantially equivalent intellectual property. If we do not effectively protect our intellectual property, or if others independently develop substantially equivalent intellectual property, our competitive position could be weakened. Effectively policing the unauthorized use of our services and technology is time-consuming and costly, and the steps taken by us may not prevent misappropriation of our technology or other proprietary assets. The efforts we have taken to protect our proprietary rights may not be sufficient or effective, and unauthorized parties may copy aspects of our services, use similar marks or domain names, or obtain and use information, marks, or technology that we regard as proprietary. We may have to litigate to enforce our intellectual property rights, to protect our trade secrets, or to determine the validity and scope of othersÕ proprietary rights, which are sometimes not clear or may change. Litigation can be time consuming and expensive, and the outcome can be difficult to predict. Like others in our industry, we continue to face advanced and persistent attacks on our information infrastructure where we manage and store various proprietary information and sensitive/confidential data relating to our operations. These attacks may include sophisticated malware (viruses, worms, and other malicious software programs) and phishing emails that attack our products or otherwise exploit any security vulnerabilities. These intrusions sometimes may be zero-day malware that are difficult to identify because they are not included in the signature set of commercially available antivirus scanning programs. Experienced computer programmers and hackers may be able to penetrate our network security and misappropriate or compromise our confidential information or that of our customers or other third-parties, create system disruptions, or cause shutdowns. Additionally, sophisticated software and applications that we produce or procure from third-parties may contain defects in design or manufacture, including ÒbugsÓ and other problems that could unexpectedly interfere with the operation of the information infrastructure. A disruption, infiltration or failure of our information infrastructure systems or any of our data centers as a result of software or hardware malfunctions, computer viruses, cyber attacks, employee theft or misuse, power disruptions, natural disasters or accidents could cause breaches of data security, loss of critical data and performance delays, which in turn could adversely affect our business. There is no existing trading market for Q2 Tokens and an active trading market may never develop. The Q2 Tokens are new digital tokens for which there is no established public market. Although we may attempt to list Q2 Tokens on exchanges capable of listing security tokens in compliance with all applicable laws, there can be no assurance that such exchanges will accept the listing of Q2 Tokens or maintain such listing if it is initially accepted. There can be no assurance that a secondary market will develop, or if a secondary market does develop, there can be no assurance that it will provide holders of Q2 Tokens with liquidity of investment or that liquidity will continue for any specific period. The liquidity of any market for Q2 Tokens will depend on a number of factors, including, but not limited to the following: ¥ The number of Q2 Token holders; ¥ The sales of Quarters; ¥ The market for similar digital tokens; ¥ The interest of market makers, if any, in Q2 Tokens; ¥ Regulatory developments in the digital token and cryptocurrency industries; and ¥ Legal restrictions on transfer. The digital token market is a new and rapidly developing market which may be subject to substantial and unpredictable disruptions that cause significant volatility in the prices of digital tokens. There is no assurance that the market, if any, for the Q2 Tokens will be free from such disruptions or that any such disruptions may not adversely affect a Q2 Token holderÕs ability to sell his or her Q2 Tokens. Therefore, we can provide no assurance that Q2 Token holders will be able to sell Q2 Tokens at a particular time, or that the price received upon sale will be favorable. Holders of Q2 Tokens will have no voting or control rights and may have conflicts of interest with POQ Manager. The Q2 Tokens have no voting rights or other management or control rights in either the Company or any entity affiliated with the Company. POQ Manager will, in its sole and absolute discretion, control all material decisions for the Company, and it will appoint the officers who exercise day-to-day control over the CompanyÕs business. The interests of Q2 Token holders and POQ Manager may not be aligned, and consequently, the actions of POQ Manager may not be in the best interests of Q2 Token holders. No repurchase or redemption of Q2 Tokens. The Q2 Token holders do not have the right to compel the Company or any other entity to redeem the Q2 Tokens. The Quarters ecosystem may not be widely adopted and may have limited number of users. 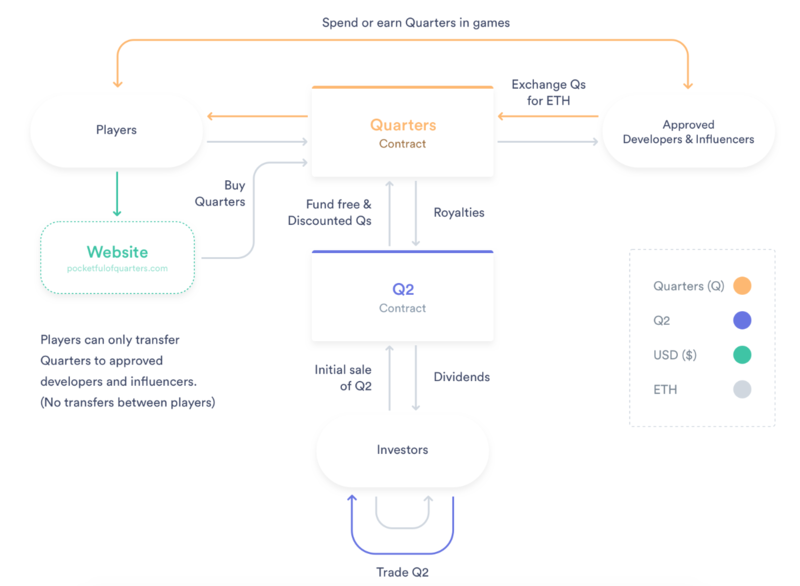 It is possible that many players, developers and other actors in the gaming industry will not use the Quarters ecosystem, or that significant public interest in the creation and development of the Quarters ecosystem will not develop. Such lack of use or interest will negatively impact the development of the Quarters ecosystem, the potential utility of Quarters, and the value of the Q2 Tokens. The Quarters ecosystem, as developed, might not meet the expectations of Purchasers. The Quarters ecosystem is presently under development, and its governance structure, fees, purpose, consensus mechanism, algorithm, code, infrastructure design and other technical specifications and parameters may undergo significant changes without notice at any time, and from time to time. Any expectations regarding the form and functionality of the Quarters ecosystem held by the Purchaser may not be met, for any number of reasons, including a change in the design and implementation plans and execution of the Quarters ecosystem. The Quarters ecosystem may malfunction. It is possible that the Quarters ecosystem malfunctions in an unfavorable way, including, but not limited to, one that results in the loss of Tokens or valuable information. Alternative networks may be established that compete with or are more widely used than the Quarters ecosystem. It is possible that alternative networks could be established that utilize the same or similar services as the Quarters ecosystem and attempt to facilitate services that are materially similar to the Quarters ecosystem. The Quarters ecosystem may compete with these alternative networks, which could negatively impact the Quarters ecosystem and the value of the Q2 Tokens. The open source nature of the Quarters ecosystem means that the Quarters ecosystem could be copied and a ÒforkÓ can be created, causing confusion regarding the official Quarters ecosystem. Some of the software in the Quarters ecosystem, including the Quarters Smart Contract (the ÒQSCÓ) and the Q2 Tokens Smart Contract (ÒQ2SCÓ), are open source, which means that the underlying software code is publicly available and can be viewed and copied by anyone. The open source nature of our software creates a risk that it can be copied by unrelated third-parties and those unrelated third-parties can create a ÒforkÓ of the Quarters ecosystem. If a ÒforkÓ of the Quarters ecosystem is created, this could give rise to confusion as to which is the official Quarters ecosystem. A ÒforkÓ of the Quarters ecosystem could attract users of Quarters and cause the adoption of Quarters to decrease if users prefer to use the new version of the Quarters ecosystem that would be developed if a ÒforkÓ is created. There are also unforeseeable risks that could come to fruition due to the open source nature of our software or if a ÒforkÓ of the Quarters ecosystem is created. These risks could cause the value of the Q2 Tokens, if any, to decline. The Quarters ecosystem may be a target for malicious cyberattacks and may contain exploitable flaws in its underlying code, which may result in security breaches and the loss or theft of Quarters and Q2 Tokens. The Quarters ecosystem, the software application and other interfaces or applications built upon the Quarters ecosystem are still in an early development stage and are unproven, and there can be no assurances that the Quarters ecosystem and the creating, transfer or storage of Quarters and Q2 Tokens will be uninterrupted or fully secure, which may result in a complete loss of holdersÕ Quarters and Q2 Tokens or an unwillingness of users to access, adopt and utilize the Quarters ecosystem. The nature of crypto assets, such as Quarters and Q2 Tokens, may lead to an increased risk of fraud or cyberattack. Hackers or other malicious groups or organizations may attempt to interfere with the purchase of Quarters and Q2 Tokens in a variety of ways, including, but not limited to, malware attacks, denial of service attacks, spoofing, social engineering, phishing emails, man-in-the-middle attacks, and ransomware. Recently, other platforms that sponsor and engage in transactions in crypto assets have been the subject of cyberattacks that have resulted in a loss of crypto assets. Among other things, Purchasers could lose the purchase price paid by them due to these types of threats, or the Company and the QSC or Q2SC could experience a loss of Quarters and Q2 Tokens, in its own wallet, which could significantly undermine the Quarters ecosystem and significantly reduce the value of Q2 Tokens. If the Quarters ecosystemÕs security is compromised or if the Quarters ecosystem is subjected to attacks that frustrate or thwart our usersÕ ability to access the Quarters ecosystem, then users may decrease or stop using the Quarters ecosystem, and developers may stop developing, stop publishing, and remove published games that use the Quarters ecosystem, which could cause a severe decline in the value of the Q2 Tokens. Purchasers are responsible for educating themselves about protecting their personally identifiable information and about cybersecurity best practices. While the Company or POQ Central may take steps to prevent or mitigate the impact of cyberattacks, there can be no guarantee that the Company or POQ Central will be successful in preventing any or all cyberattacks on its systems. Transactions in virtual currency such as Quarters may be untraceable and irreversible, and accordingly, losses due to fraudulent or accidental transactions may not be recoverable. The source code of the Quarters ecosystem could contain fatal flaws. While the Company adopts quality assurance procedures to help ensure the source codes reflect as accurately as possible their intended operation, the flawlessness of the source codes cannot be guaranteed. They may contain bugs, defects, inconsistencies, flaws or errors, which may disable some functionality, create vulnerabilities or cause instability. Such flaws may compromise the predictability, usability, stability, and/or security of the Quarters ecosystem. Loss of a PurchaserÕs private key could result in a loss of Q2 Tokens. Once Q2 Tokens are delivered, each PurchaserÕs Q2 Token balance is associated with the PurchaserÕs Ethereum public key address, which is in turn associated with the PurchaserÕs Ethereum private key address. Purchasers are solely responsible for knowing their private key addresses and keeping them a secret. Because a private key, or a combination of private keys, is necessary to control and dispose of the Q2 Tokens stored in each PurchaserÕs digital wallet, the loss of one or more of the PurchaserÕs private keys associated with the PurchaserÕs digital wallet storing the Q2 Tokens will result in the loss of the PurchaserÕs Q2 Tokens. Moreover, any third party that gains access to one or more of any PurchaserÕs private keys, including by gaining access to login credentials of a hosted wallet service the Purchaser uses, may be able to misappropriate the PurchaserÕs Q2 Tokens. The Company and its affiliates will never ask any Purchaser for the PurchaserÕs private key address, and the Purchaser should never share his or her private key address with someone the Purchaser does not know. Purchasers are solely responsible for selecting a wallet or wallet service provider that is technically compatible with the Q2 tokens to be used for the acquisition and storage of Q2 Tokens. The wallet or wallet service provider selected by each Purchaser will not manage or control the Q2 Tokens, and such wallet or wallet service provider is an entirely independent third-party company. The failure to assure that compatibility may result in the Purchaser not being able to gain access to the Q2 Tokens. Purchasers are subject to third-party exchange and custody risks. If a Purchaser sends ETH to the Q2SC from an exchange or an account that the Purchaser does not control, Q2 Tokens may be allocated to the account that has sent the ETH, and not personally to the Purchaser. Therefore, Purchasers may never receive or be able to recover the PurchaserÕs Q2 Tokens. Moreover, if the Purchaser chooses to maintain or hold Q2 Tokens using a third party, the Purchaser will be subject to the risks associated with that third party and the PurchaserÕs Q2 Tokens may be stolen or lost. The tax treatment of the Q2 Tokens is uncertain and there may be tax consequences for Purchasers upon certain future events. The tax characterization of the Q2 Tokens is uncertain, and each Purchaser must seek its own tax advice in connection with an investment in the Q2 Tokens. An investment in the Q2 Tokens may result in tax consequences to Purchasers, including withholding taxes, income taxes and tax reporting requirements. Each Purchaser should consult with and must rely solely upon the advice of its own professional tax advisors with respect to the United States and non-U.S. tax treatment of an investment in the Q2 Tokens. The tax characterization of the Q2 Tokens also affects the CompanyÕs own tax liability in connection with this offering. Purchasers may lack information for monitoring their investment. The Q2 Tokens do not have any information rights attached to them, and Purchasers may not be able to obtain all the information they would want regarding the Company, its affiliates, or the Q2 Tokens. In particular, Purchasers may not be able to receive information regarding the financial performance of the Q2 Tokens with respect to the ability of Q2 Token holders to receive dividends. The Company is not currently registered with the Securities and Exchange Commission and currently has no periodic reporting requirements. As a result of these difficulties, as well as other uncertainties, Purchasers may not have accurate or accessible information about the Company or the Q2 Tokens. The Q2 Tokens and the Quarters ecosystem have no history. The Quarters and the Q2 Tokens will be newly issued, and POQ Issuer, POQ Central, and POQ Manager are newly formed and have no operating history and are entirely novel in type. Purchasers will not be able to compare them against other like instruments. We have based the description of the future operations of our business and the projections for its performance contained in this memorandum on the knowledge and experience of our management, which is limited, and cannot be verified as applicable to our business until well after it has actually begun operations. An investment in the Q2 Tokens should be evaluated on the basis of the value and prospects of the Quarters ecosystem and the Q2 Tokens, including an assessment of whether the projected performance of the Quarters ecosystem may not prove accurate, and that the Company may not be able to achieve its objectives. We have not based the financial projections on actual operations. Because our business has no operating history we cannot provide a balance sheet or income statement based on actual operations. For example, projected revenues are based on our managementÕs belief that Quarters will gain adoption by users, however this cannot be assured. Moreover, a decline in prices in the cryptocurrency market or a decline in the price of ETH could significantly reduce the value of Q2 Tokens. The Company may experience data privacy and data retention issues. As part of this offering and the subsequent verification processes, the Company may collect personal information from Purchasers. The collection of such information is subject to applicable laws and regulations. All information collected will be used for purposes of consummating a purchase and sale in this offering, and may be transferred to contractors, service providers and consultants worldwide as appointed by the Company. Apart from external compromises, the Company and its appointed entities may also suffer from internal security breaches whereby their employees may misappropriate, misplace or lose personal information of Purchasers. Any information breaches or losses will also damage the CompanyÕs reputation and may harm its long-term prospects, which will have a negative effect on the value of the Q2 Tokens. Moreover, the Company must maintain its access to the private key that manages both the QSC and the Q2SC. If these keys are guessed, hacked, or accessed by another party, the system may be compromised, and investors may experience a partial or total loss of their Q2 Tokens and any unpaid royalties associated with those Q2 Tokens. One of the CompanyÕs co-founders is a minor. George Weiksner, a co-founder and officer of the Company is currently a minor, 12 years old as of the date of this Form C. George may lack the necessary experience and skill required to help effectively manage a growing company. Moreover, George has a full-time commitment to school and other activities and may not have the time and resources necessary to commit to development of our business. If George is unable to be involved with the management of the Company, it is possible that POQ Manager may be adversely impacted, in which case the value of the Q2 Tokens could be negatively impacted. The CompanyÕs co-founders, who are father and son and own and control POQ Manager, may have interests that conflict with yours. G. Michael Weiksner, one of the CompanyÕs co-founders, is the father of George Weiksner, the CompanyÕs other co-founder. They own and control POQ Manager. Because investors in Q2 Tokens have an economic interest in the Company that is exclusively linked to revenues generated by Quarter sales, their interests may diverge from those of our owners and POQ Manager, who hold 100% of the equity of the Company and benefit from overall performance of the Company. Our co-founders, whose interests are closely linked by their family ties, could exercise their control of the Company in a way that may benefit the Company but is detrimental to the Q2 Token holders. Because the rights of Q2 Token holders are contractual in nature, neither our officers nor POQ Manager will have a fiduciary duty to protect the interests of Q2 Token holders. As a result, Q2 Token holders may have little or no legal recourse if they experience losses because the CompanyÕs management acts in the CompanyÕs interest rather than theirs. POQ Central may be sold to a third-party, in which case control of the Quarters ecosystem could pass to that third-party. The Company, POQ Manager, and POQ Central may be sold or merged, or new management may be hired. Ownership of the QSC and Q2SC may be sold or transferred. Purchasers should invest in Q2 Tokens only if they believe that their interests align with the Quarters ecosystem rather than depending on the participation of any particular manager or owner. The variables and formulas within the QSC and the Q2SC may be changed. The Company, our management, and POQ Central have absolute control over the QSC and the Q2SC and may adjust variables within the QSC and the Q2SC in their sole and absolute discretion. If formulas and variables are altered in the QSC or the Q2SC, the earnings attributable to each Q2 Token may change and as a result, the value of Q2 Tokens could be materially diminished. Hot wallets hosted by the Company may be hacked and Quarters and Q2 Tokens may be stolen. POQ Central will manage Òhot wallets,Ó which are connected to the Internet, for players and developers. Those Òhot walletsÓ will likely be the target of malicious attackers. A security breach of the Òhot walletsÓ administered by POQ Central could negatively impact the Quarters ecosystem and the value of the Q2 Tokens. The Quarters ecosystem may not be able to scale to meet growing demand. If the Quarters ecosystem is successful, the purchase of Quarters could require many transactions which the Ethereum network, the network upon which the Quarters ecosystem is built, may not be able to meet the demand as the Ethereum network becomes congested. Although our management believes that the Ethereum Foundation is working on solutions to allow the Ethereum network to scale, these initiatives may not be completed, or they may be ineffective, either of which would adversely impact the ability of players and developers to purchase and transfer Quarters, which could in turn negatively impact the value of the Q2 Tokens. There are risks associated with the Ethereum protocol. Because the Q2 Tokens are based on the Ethereum protocol, any malfunction, breakdown or abandonment of the Ethereum protocol may have a material adverse effect on the Q2 Tokens. Moreover, advances in cryptography, or technical advances such as the development of quantum computing, could present risks to the Q2 Tokens by rendering ineffective the cryptographic consensus mechanism that underpins the Ethereum protocol. The regulatory regime governing blockchain technologies, cryptocurrencies, digital assets, and offerings of digital assets, such as the Q2 Tokens, is uncertain, and new regulations or policies may adversely affect the development of the Quarters ecosystem and the value of the Q2 Tokens. Regulation of digital assets, like the Tokens, and offerings such as this, involving cryptocurrencies and blockchain technologies, is currently underdeveloped and likely to rapidly evolve as government agencies take greater interest in them. Such regulation varies significantly among international, federal, state, and local jurisdictions and is subject to significant uncertainty. Various legislative and executive bodies in the United States and in other countries may in the future adopt laws, regulations, or guidance, or take other actions, which may severely impact the permissibility of the Quarters ecosystem and the Q2 Tokens, tokens generally, and, in each case, the technology behind them or the means of transaction in or transferring them. Failure by the Company or certain users of the Tokens to comply with any laws, rules, and regulations, some of which may not exist yet or that are subject to interpretations that may be subject to change, could result in a variety of adverse consequences, including civil penalties and fines. Cryptocurrency networks, distributed ledger technologies, and coin and token offerings also face an uncertain regulatory landscape in many foreign jurisdictions. Various foreign jurisdictions may, in the near future, adopt laws, regulations, or directives that affect the Tokens. Such laws, regulations, or directives may conflict with those of the United States or may directly and negatively impact the Quarters ecosystem. The effect of any future regulatory change is impossible to predict, but such change could be substantial and materially adverse to the adoption of the Quarters ecosystem and the value of the Q2 Tokens. New or changing laws and regulations or interpretations of existing laws and regulations, in the United States and other jurisdictions, may materially and adversely impact the value of the Q2 Tokens, including with respect to the dividends that may be distributed, the liquidity of the Q2 Tokens, the ability to access marketplaces or exchanges on which to trade the Q2 Tokens, and the structure, rights, and transferability of Q2 Tokens. The further development and acceptance of blockchain networks, which are part of a new and rapidly changing industry, are subject to a variety of factors that are difficult to evaluate. The slowing or stopping of the development or acceptance of blockchain networks and blockchain assets would have an adverse effect on the successful development and adoption of the Quarters ecosystem. The growth of the blockchain industry in general, as well as the blockchain networks on which the Tokens rely, is subject to a high degree of uncertainty. The factors affecting the further development of the cryptocurrency industry, as well as blockchain networks, include, without limitation: ¥ Worldwide growth in the adoption and use of cryptocurrencies and other blockchain technologies; ¥ The maintenance and development of the opensource software protocol of cryptocurrency networks; ¥ General economic conditions and the regulatory environment relating to cryptocurrencies and other blockchain assets; and ¥ A decline in the popularity or acceptance of cryptocurrencies or other blockchain-based tokens. The cryptocurrency industries as a whole have been characterized by rapid changes and innovations and are constantly evolving. Although they have experienced significant growth in recent years, the slowing or stopping of the development, general acceptance, and adoption and usage of blockchain networks and blockchain assets may deter or delay the acceptance and adoption of the Quarters ecosystem. The prices of digital assets are extremely volatile. Fluctuations in the price of digital assets could materially and adversely affect the Quarters ecosystem, and the Q2 Tokens may also be subject to significant price volatility. The prices of cryptocurrencies, such as Bitcoin and Ether, and other digital assets have historically been subject to dramatic fluctuations and are highly volatile, and the market price of the Q2 Tokens may also be highly volatile. A decrease in the price of a single digital asset may cause volatility in the entire digital asset industry and may affect other digital assets including the Q2 Tokens. For example, a security breach that affects purchaser or user confidence in Bitcoin or Ether may affect the industry as a whole and may also cause the price of the Q2 Tokens and other digital assets to fluctuate. Moreover, Q2 Tokens may be subject to price volatility because of speculation in the market as market participants may purchase or sell large amounts of Q2 Tokens, which would increase the volatility of the price of the Q2 Tokens. Such volatility in the price of the Q2 Tokens may result in significant loss over a short period of time. The popularity of cryptocurrencies may decrease in the future, which could have a material impact on the cryptocurrency industry, the Quarters ecosystem, and the value of the Q2 Tokens. The Quarters ecosystem relies upon the viability of the cryptocurrency markets. In recent years, cryptocurrencies have become more widely accepted, but have also faced increasingly complex legal and regulatory challenges and, to date, have not benefited from widespread adoption by governments, central banks, or established financial institutions. Any significant decrease in the acceptance or popularity of cryptocurrencies may adversely affect the Quarters ecosystem and the value of the Q2 Tokens. There are risks associated with an unpermissioned, decentralized, and autonomous ledger. The Quarters ecosystem is being developed in connection with various distributed ledger systems, including Ethereum, which is an unpermissioned protocol that can be accessed and used by anyone. The utility and integrity of the Quarters ecosystem relies on the stability, security, and popularity of these decentralized ledgers. If the stability, security, or popularity of decentralized ledgers decreases, then the Quarters ecosystem may be negatively impacted, which could have a negative impact on the value, if any, of Q2 Tokens. The Quarters ecosystem is envisioned to be an open, decentralized community, and its composition can include users, supporters, developers, Token holders and other participants worldwide who may or may not be connected with the Company in any manner. Given the diversity of the underlying technologies, the Quarters ecosystem is intended to be decentralized and autonomous in nature as far as its maintenance, governance, and evolution are concerned. Having such decentralized and autonomous system presents unpredictable risks, and the Quarters ecosystem could be compromised, and consequently the value, if any, of Q2 Tokens could decrease, since third-parties may take actions that harm the Quarters ecosystem. Breakthroughs in the field of cryptography could create significant weaknesses in security for blockchain-based technologies. Cryptography is evolving and there can be no guarantee of security at all times. Advancement in cryptography technologies and techniques, including, but not limited to, code cracking, and the development of artificial intelligence and/or quantum computers, could be identified as risks to all cryptography-based systems, including the Quarters ecosystem. When such technologies and/or techniques are applied to the Quarters ecosystem, adverse outcomes such as theft, loss, disappearance, destruction, devaluation, or other compromises may result. The security of the Company and the Quarters ecosystem cannot be guaranteed as the future of cryptography or security innovations is unpredictable. Quarters could be deemed to be securities. The value of Q2 Tokens depends on our ability to disseminate Quarters and derive revenue from their sales. Although our management believes that Quarters are purely a Òutility tokenÓ and are not securities, the Securities and Exchange Commission has noted that the issuance of tokens represents a new paradigm and the application of the federal securities laws to this new paradigm is very fact specific. If Quarters were deemed to be a security under U.S. federal securities laws or state securities laws, then prior to their planned issuance, we may be required to register their dissemination under the Securities Act or qualify them under state law. The registration of Quarters under the Securities Act, or qualification under state law, would result in significant delay in their issuance and would require us to incur substantial additional expense. When disseminating Quarters, the Company plans to obtain certain information from the intended recipients of Quarters. If Quarters are deemed to be securities, then the dissemination of Quarters could be considered to be an offer and sale of securities in violation of applicable securities laws. If the Company proceeds with its planned dissemination of Quarters and a government agency determines that the Company is offering securities without complying with applicable securities laws, then the agency could require the sale and use of Quarters to cease, and it could impose penalties on the Company, which would have a material negative impact on the value of the Q2 Tokens. The Company may not receive the necessary funds to fully realize its business plan. The Company may be unable to obtain additional financing. Our business cannot be easily scaled back or divided into phases to accommodate a shortfall in financing, and insufficient cash could reduce or eliminate any return on your investment. The Purchasers will have no control of the Company. The Company will depend on the efforts of its management. Purchasers have no control over our management, the Company, or our business. You should not purchase the Securities unless you are willing to entrust all aspects of the day-to-day management of the business to the Company and its management. Purchasers will have no control over POQ Central. POQ Central helps provide functionality that may contribute to the Quarters ecosystem and consequently impact the value of Q2 Tokens. Purchasers will have no ownership, control, or any rights to participate in the management and decision making of POQ Central. Purchasers will bear tax risks. Investment in Q2 Tokens involves substantial tax risks. Although the primary motive of Purchasers should be for long-term returns, state and federal legislatures and tax authorities may alter and change current tax laws and tax rates to ones that are less favorable to Q2 Token holders. The tax risks include, without limitation, the effect of changes in federal income tax laws, taxable income in excess of distributions, and limitations on passive losses. The transfer of Q2 Tokens is highly restricted. The Q2 Tokens are a highly illiquid asset, in that the holder cannot readily sell a Q2 Token or pledge it as collateral for a loan or other obligation. We have not registered the Q2 Tokens under the Securities Act or under any state securities law, and do not intend to do so. A Purchaser may not assign, sell, or transfer his or her Q2 Tokens except in accordance with applicable securities laws. Finally, no public market exists for the resale of Q2 Tokens, and a public resale market may never develop. These restrictions make it unlikely that a Purchaser who wanted to sell or otherwise dispose of Q2 Tokens could readily do so in the immediate future. Therefore, you should acquire a Q2 Token for investment purposes only, based on returns you may receive directly from the Q2SC, and not with a view to resale or other distribution. Our management does not have exclusive duties to the Company and may pursue other business and investment opportunities that do not include the Purchasers. Our management does not owe exclusive obligations to the Company or the Purchasers. In particular, G. Michael Weiksner need only devote as much time to the CompanyÕs affairs as he believes, in its sole discretion, necessary to manage the business. Our managers and officers may take part from time to time in the development of other projects that may compete with our business. Commitments undertaken by our managers and officers in connection with such other business projects may reduce their effectiveness in managing the business and ensuring its profitability and the value of the Q2 Tokens. Potential conflicts of interest exist among POQ Manager, the Company, its officers and the Purchasers. Because the POQ Manager and the Company are under common ownership, neither the agreements underlying our business, nor the financial terms of the Q2 Tokens, have been negotiated at armÕs length. Purchasers should carefully read the exhibits to this memorandum to understand their rights and understand that our officers may experience conflicts of interest in managing the Company and the Q2 Tokens. The price of the Securities is unrelated to the net tangible value, cash flow, or operating history of the Company. The Securities do not represent an interest in the equity, assets, or earnings of our Company. In establishing the offering price for the Securities, we did not base the price on earnings, operating history, assets, book value, or any other recognized criterion of value. We obtained no independent opinion or appraisal in determining the offering price. Our business could be abandoned or it may fail. Due to the technically complex nature of the Quarters ecosystem, the Company or those contributing to the Quarters ecosystem software development effort could face difficulties from time to time that may be unforeseeable and/or unresolvable. Accordingly, the development of the Quarters ecosystem could fail, terminate, or be delayed at any time and from time to time for any reason, including due to lack of funds. Development failure or termination may render the Q2 Tokens non-transferrable, of reduced or no utility, and/or obsolete. There are unanticipated risks with investing in Q2 Tokens. Applied cryptography and blockchain technology are new and untested. In addition to the risks set forth here, there are risks that the Company and its management cannot anticipate. Risks may further materialize as unanticipated combinations or variations of the risks set forth here. If the Securities are paid back in Q2 Tokens, it is unclear whether or not these Q2 Tokens will be freely tradable. At the moment, there is no definitive regulatory position on whether blockchain tokens are securities or utility devices. While the Company believes any tokens used to fulfill its debt obligations would be considered non-securities assets, and therefore freely tradeable on the open market, there is a risk that regulators may deem Q2 Tokens securities, therefore substantially limiting their liquidity. There are regulatory risks associated with the CompanyÕs operation, with the potential treatment of digital assets as securities, and with unforeseen legal restrictions on debt repayments using digital assets as a novel legal construct. The offering is a debt offering by a non-investment service company under Regulation Crowdfunding. However, there is a regulatory risk associated with (i) the offering registration and exemption eligibility; (ii) redistribution of any assets that constitute ÒsecuritiesÓ; and (iii) any activities that are deemed investment activities, investment advisory activities, and/or brokering or dealing activities by the issuer. Operating and legal expenses incurred by the issuer to address, challenge and resolve any unfavorable regulatory position may be substantial and may result in the issuerÕs insolvency. Digital tokens and currencies may or may not meet the definition of ÒsecuritiesÓ under US securities law depending on specific facts pertaining to the relevant blockchain project and token uses. There is a risk that the token assets useable to repay the debt obligations under the terms of the offering constitutes securities, in which case the issuer and its affiliates and partners may be restricted or even prohibited from delivering or facilitating the relevant token repayments. Purchasers and lenders should carefully consult regulatory guidelines on crypto-currencies and crypto investing prior to participating in this offering. The DPAs (Debt Payable by Assets) will not be freely tradable until one year from the initial purchase date. Although the DPAs may be tradable under federal securities law, state securities regulations may apply and each Purchaser should consult with his or her attorney. You should be aware of the long-term nature of this investment. There is not now and likely will not be a public market for the DPAs. Because the DPAs have not been registered under the Securities Act or under the securities laws of any state or non-United States jurisdiction, the DPAs have transfer restrictions and cannot be resold in the United States except pursuant to Rule 501 of Regulation CF. It is not currently contemplated that registration under the Securities Act or other securities laws will be effected. Limitations on the transfer of the DPAs may also adversely affect the price that you might be able to obtain for the DPAs in a private sale. Purchasers should be aware of the long-term nature of their investment in the Company. Each Purchaser in this Offering will be required to represent that it is purchasing the Securities for its own account, for investment purposes and not with a view to resale or distribution thereof. No governmental agency has reviewed or passed upon this Offering, the Company or any Securities of the Company. The Company also has relied on exemptions from securities registration requirements under applicable state securities laws. Purchasers in the Company, therefore, will not receive any of the benefits that such registration would otherwise provide. Prospective investors must therefore assess the adequacy of disclosure and the fairness of the terms of this Offering on their own or in conjunction with their personal advisors. No guarantee of any return on investment. Prior to the Offering the CompanyÕs current owners of 20% or more beneficially own up to 100.0% of the Company. Subject to any fiduciary duties owed to our other owners or investors under Delaware law, these owners may be able to exercise significant influence over matters requiring owner approval, including the election of managers and approval of significant Company transactions, and will have significant control over the CompanyÕs management and policies. Some of these persons may have interests that are different from yours. The concentration of ownership could delay or prevent a change in control of the Company or otherwise discourage a potential acquirer from attempting to obtain control of the Company, which in turn could reduce the price potential investors are willing to pay for the Company. In addition, these owners could use their voting influence to maintain the CompanyÕs existing management, delay or prevent changes in control of the Company, or support or reject other management and board proposals that are subject to owner approval. The Company has the right to limit individual investors commitment amount based on the CompanyÕs determination of a PurchaserÕs sophistication. The Company may prevent Purchasers from committing more than a certain amount to this Offering based on the CompanyÕs belief of the PurchaserÕs sophistication and ability to assume the risk of the investment. This means that your desired investment amount may be limited or lowered based solely on the CompanyÕs determination and not in line with relevant investment limits set forth by the Regulation Crowdfunding rules. This also means that other Purchasers may receive larger allocations of the Offering based solely on the CompanyÕs determination. Purchaser is not an owner of the Company and has no decision-making or voting rights. You are not entitled, as a holder of the Securities, to vote or receive dividends or be deemed the holder of capital stock for any purpose, nor will you have any of the rights of a stockholder or member of the Company, as applicable, or any right to vote for the election of directors or upon any matter submitted to stockholders or members, as applicable, at any meeting thereof, or to give or withhold consent to any Company action or to receive notice of meetings, or to receive subscription rights. Accordingly, no person should purchase a Security unless he or she is willing to entrust all aspects of management to the Company. Furthermore, you will not have any rights to the profits or intellectual property of the Company, and your only claim to the assets of the company are the rights of payment as set forth in the DPA. The Securities will be effectively subordinate to any of our debt that is secured. The Securities will be unsecured, unguaranteed obligations of the Company and will be effectively subordinated to any present or future secured debt obligations that we may incur in the future to the extent of the value of the assets securing that debt. Currently the company has no other debt outstanding. The effect of this subordination is that if we are involved in a bankruptcy, liquidation, dissolution, reorganization or similar proceeding, or upon a default in payment on, or the acceleration of, any of our secured debt, if any, our assets that secure debt will be available to pay obligations on the Securities only after all debt under our secured debt, if any, has been paid in full from those assets. Holders of the Securities will participate in any remaining assets ratably with all of our other unsecured and unsubordinated creditors, including trade creditors. We may not have sufficient assets remaining to pay amounts due on any or all of the Securities then outstanding. You must provide valid network address and other information for token distribution or forfeit ability to receive tokens. In the event the Company elects or is required under the terms of the Securities to make a repayment of the Debt Amount, as defined in the Security, (in part or in full) by Q2 Tokens, and you fail to provide the Company within thirty (130) calendar days a network address and other information necessary to facilitate a distribution of digital blockchain tokens, the Company may in its discretion effectuate such repayment in cash and without any interest on such full or partial Debt Amount, without any further obligations. You are responsible for the accuracy of information provided. Providing inaccurate digital key or public address for purposes of token transfer often results in irreversible loss, which nonetheless would constitute satisfaction of the CompanyÕs debt repayment obligations. The provisions of the Securities relating to a liquidation event or change of control transactions will not necessarily protect you. The provisions in the Securities will not necessarily afford you protection in the event of a transaction that may adversely affect you, including a reorganization, restructuring, merger or other similar transaction involving us. These transactions may not involve a Òliquidation eventÓ or Òchange of controlÓ which would trigger these protective provisions. Except in certain circumstances, the Securities will not permit the holders of the Securities to require us to repurchase the Securities in the event of a takeover, recapitalization or similar transaction. We may not be able to repurchase all of the Securities upon a liquidation event or change of control repurchase event. Upon the occurrence of events constituting a liquidation event or change of control, we will be required to offer to repurchase the Securities. We may not have sufficient funds to repurchase the Securities in cash at such time or have the ability to arrange necessary financing on acceptable terms. In addition, our ability to repurchase the Securities for cash may be limited by law or the terms of other agreements relating to our indebtedness outstanding at the time. In the event the Securities are repaid in Q2 Tokens, future regulatory actions or policies may limit the ability to exchange Q2 Tokens or utilize them for payments, or it may make it illegal to acquire, own, hold, sell or use Q2 Tokens in one or more countries. New regulations may make it more difficult to acquire and/or use Q2 Tokens. Furthermore, regulatory actions may limit the ability of end-users to convert Q2 Tokens into fiat currency (e.g., U.S. Dollars) or use Q2 Tokens to pay for goods and services. Such regulatory actions or policies would negatively affect our business and decrease the value of the Securities. Therefore, if the Company pays back the Security in Q2 Tokens, instead of cash, this may prove to be an illiquid and potentially worthless repayment method. Although currently tokens are not regulated or are lightly regulated in most countries, including the United States, one or more countries may take regulatory actions in the future that severely restricts the right to acquire, own, hold, sell or use tokens or to exchange tokens for fiat currency. Such an action may also result in the restriction of ownership, holding or trading in the Securities. Such a restriction could result in the termination and liquidation of the Company at a time that is disadvantageous to Purchasers or may adversely affect an investment in the Company. We may not be able to generate sufficient cash flow to meet our interest payment obligations on the Securities nor repay the principal. Our ability to generate sufficient cash flow from operations to make scheduled interest payments on the Securities will depend on our future financial performance, which will be affected by a range of economic, competitive, and business factors, many of which are outside of our control. The Company will be in default if it is unable to pay interest or principal when due, which could force us to discontinue our business. If we do not generate sufficient cash flow from operations, we may have to undertake alternative financing plans, such as refinancing or restructuring our debt, selling assets, reducing or delaying capital investments, or seeking to raise additional capital. We cannot assure you that any refinancing would be possible, that any assets could be sold, or, if sold, of the timing of the sales and the amount of proceeds realized from those sales, or that additional financing could be obtained on acceptable terms, if at all, or would be permitted under the terms of the agreements governing our indebtedness then outstanding. Our inability to generate sufficient cash flow to satisfy our interest payments on the Securities would severely negatively impact your investment in the Securities. In the event the company is unable to generate sufficient cash flow or service interest payments, there is a large risk that the company could default on the debt and be unable to repay it, in either cash or Tokens. Due to the fees associated with this Offering, at its conclusion, assuming it is successful, the Company will already have less assets than necessary to repay the Securities in full in cash. There is no guarantee that the Security will be paid back in Q2 Tokens. Per the terms of the Securities, if the Company cannot produce Q2 Tokens, the only means to pay back the debt is in cash. The United States tax rules applicable to an investment in the Securities and in the event the Security is repaid in Tokens are uncertain and the tax consequences to an investor of an investment in the Securities could differ from the investorÕs expectations. The tax rules applicable to the Securities, specifically if the Security is repaid using Q2 Tokens instead of cash, are complex, and no statutory, judicial, or administrative authority directly addresses the characterization of an investment in the CompanyÕs securities. The tax consequences to a Purchaser of the Securities could differ from the PurchaserÕs expectations. Purchasers should consult their own tax advisors. The term of the debt instrument and all the rights to receive Tokens from it, will expire at 6 months. If the Company is not able to distribute Q2 Tokens within 6 months of the issuance of the debt instrument, it will pay investors back with all remaining cash on hand, with interest due pursuant to the terms of the DPA agreement (the ÒDebt AgreementÓ). This means, PurchaserÕs upside is potentially capped at the rate of return described in the Debt Agreement. Purchasers should be willing to accept a hard cap on their possible gain from investment. If this debt instrument is repaid in Q2 Tokens, the price of the Q2 Tokens may be set arbitrarily by the Company. This means that the value of this DPA relative to the cost of Q2 Tokens cannot be determined or guaranteed. In the event the DPA is repaid in Q2 Tokens, the asset interest rateÕs value cannot be determined at the time the DPA is issued. You should consult the full terms of the DPA and the CompanyÕs offering before determining whether it is appropriate for you. The Company may use other methods of distribution that might allow other investors to purchase or receive Q2 Tokens on better terms than you receive under the DPA or that might dilute the value of the Q2 Tokens. In addition to the DPA Offering, the Company may also distribute the Q2 Tokens through the following mechanisms, each of which could result in both a decrease in the value of the Q2 Tokens and in certain purchasers and other recipients purchasing them on more advantageous terms: ¥ Additional Direct Sales. In the event that the Company determines that the Q2 Tokens are reasonably treated as non-securities, the Company may sell additional Q2 Tokens directly. ¥ Sale of Additional DPAs. The Company may also issue additional DPAs on better terms than the DPA you are purchasing. ¥ Mining. Q2 Tokens may also be mined in the future by users who engage in building the network blockchain after it is live. ¥ Sales and Giveaways to Other Employees. The Company anticipates providing the Q2 Tokens as a form of bonus or compensation to employees, either for free or for a reduced price. ¥ Giveaways. To encourage use and development of the network, the Company may provide Q2 Tokens as rewards to users of the network for certain activities; the Company may provide Tokens as rewards in circumstances where it believes the Q2 Tokens will not be treated as securities. Some of these sales and distributions may occur at a substantial discount to the amount paid by Purchasers in the DPAs and/or may result in other terms that are more advantageous to other investors and recipients. In addition, the Company may sponsor other types of offerings or distributions of Tokens in the future, which may further dilute the value of the Q2 Tokens or be offered on more advantageous terms. The terms of this debt instrument may hamper the CompanyÕs ability to use cash due to the use of an escrow account which will reduce the free cash available to the Company. The Security being offered has a feature which requires the Company to retain 50.0% of the net proceeds to the Company of this Offering in an escrow account monitored by Republic. As a substantial amount of the monies raised in this Offering will not be useable by the Company, whether as a surety for other debt or for payments, this term may hurt the CompanyÕs operations. As Purchasers have right to request a return of 50.0% of the net proceeds to the Company from the PurchaserÕs Subscription, the value of this escrow account may decrease over time. The Company will have the ability to request the release of all funds in the escrow account, after the first anniversary of the issuance of this Security but before the second anniversary of said issuance (the ÒCapital CallÓ). However, the Purchasers will have the ability to opt-out of the Capital Call, resulting in the Company receiving either a substantially reduced amount of capital from the escrow account or none at all, possibly leading to the CompanyÕs insolvency or the need to raise more funds. PurchasersÕ ability to redeem the Security we are issuing for cash prior to the maturity date may not provide a full return of capital and may cause the insolvency of the Company. The Security being offered has features which allow each Purchaser to redeem it prior to the second anniversary of the issuance date of the Security for partial repayment of approximately 50.0% of the net proceeds to the Company (after the payment of Intermediary expenses) from the PurchaserÕs Subscription (the ÒEarly Redemption RightÓ). Purchasers should be aware that (i) the Company is not obligated to return one-hundred (100) percent of principal in the event that the Purchaser chooses to exercise his or her Early Repayment Right; (ii) there can be no guarantee there will be sufficient assets on hand to return funds despite the use of an escrow account to secure approximately 50.0% percent of the net proceeds of this Offering and (iii) in the event that the Company requests a Capital Call that a Purchaser chooses not to opt out of, the Early Repayment Right will be extinguished. If a significant number of Purchasers request such redemptions (which may or may not include you) and the Company does not have the adequate amount of cash on hand, the company will be unable to pay such claims and may be forced to refinance, raise additional capital or become insolvent and seek bankruptcy proceedings, in which case you may lose all of your investment. We may use some or all of the money loaned to us on short notice, which could make it more difficult for us to repay the loan. The Company has the right to call for the capital held in escrow between the first and second year anniversary of the closing of the Offering. This may ultimately result in an accelerated loss in your capital, should you choose to not recall your funds held in escrow before the CompanyÕs Capital Call, as defined below, comes into effect. If the escrow is released to the Company, this may result in the use of the cash by the Company and the likelihood of your repayment in cash could be greatly reduced. Regulatory changes or actions may adversely affect the repayment of the DPAs with Q2 Tokens. As cryptocurrencies have grown in both popularity and market size, the U.S. Congress and a number of U.S. federal and state agencies (including FinCEN, SEC, CFTC, FINRA, CFPB, the Department of Justice, the Department of Homeland Security, the Federal Bureau of Investigation, the IRS, and state financial institution regulators) have begun to examine the operations of the cryptocurrency networks, users and exchanges. On-going and future regulatory actions may alter, perhaps to a materially adverse extent, the nature of an investment in the Securities repayable by tokens. Many of these agencies, including the SEC, CFPB, FINRA, the Federal Trade Commission (ÒFTCÓ) and state financial regulatory agencies, including those of Washington, Wisconsin, North Carolina, Nevada, Massachusetts, Michigan, New Hampshire, Alabama, Maryland, Maine, New Mexico, California, Florida and Hawaii, have issued consumer advisories regarding the risks posed by digital currencies. In March 2013 guidance, FinCEN took the position that any administrator or exchanger of convertible virtual currencies must register with FinCEN as a money transmitter and must comply with the anti-money laundering regulations applicable to money transmitters. FinCEN subsequently issued several interpretive letters clarifying which entities would be considered administrators or exchangers and which would be considered mere ÒusersÓ not subject to registration. The requirement that exchangers that do business in the U.S. register with FinCEN and comply with anti-money laundering regulations may increase the cost of buying and selling virtual currencies and therefore may adversely affect their price. On June 3, 2015, New York State Department of Financial Services (ÒNYDFSÓ) issued its comprehensive regulatory scheme for digital currency businesses, called the ÒBitLicense.Ó The BitLicense scheme requires most businesses involved in digital currency transactions in or involving New York, excluding merchants and consumers, to apply for a license from the NYDFS and to comply with anti-money laundering, cyber security, consumer protection, and financial and reporting requirements, among others. Other states have considered similar regimes (for example, a bill in California would have imposed a similar regime, although the bill was shelved), or have required virtual currency businesses to register with their states as money transmitters, which results in virtual currency businesses being subject to requirements similar to those of NYDFSÕs BitLicense regime. Certain state regulators, such as the Texas Department of Banking and Kansas Office of the State Bank Commissioner, have found that bitcoins do not constitute money, and that mere transmission of bitcoin does not constitute money transmission requiring licensure. The North Carolina Commissioner of Banks has issued guidance providing that North CarolinaÕs money transmission regulations only apply to the transmission of virtual currency and not its use. On June 28, 2014, the Governor of the State of California signed into law a bill that removed state-level prohibitions on the use of alternative forms of currency or value. The bill indirectly authorizes the use of bitcoins as an alternative form of money in the state. The inconsistency in applying money transmitting licensure requirements to certain virtual currency businesses may make it more difficult for virtual currency businesses to provide services, which may affect consumer adoption of virtual currencies and their prices. To date, the SEC has not asserted regulatory authority over cryptocurrency networks or cryptocurrency trading or ownership and has not expressed the view that all cryptocurrencies should be classified or treated as securities for purposes of U.S. federal securities laws. The effect of any future regulatory change on cryptocurrencies is impossible to predict, but such change could be substantial and adverse to the Company, the parent company and the parent companyÕs Q2 Tokens used to repay the Securities. The United States tax rules applicable to the Q2 Tokens and cryptocurrencies generally are uncertain and the tax consequences to a Purchaser who receive Q2 Tokens as repayment for the Securities could differ from the PurchaserÕs expectations. The tax rules applicable to the Q2 Tokens and the cryptocurrencies given to the Company are complex, and no statutory, judicial, or administrative authority directly addresses the characterization of an investment in cryptocurrencies. The tax consequences to a Purchaser of the Securities who receives repayment in Q2 Tokens could differ from the PurchaserÕs expectations. Purchasers should consult their own tax advisors. Neither the Company nor counsel to the Company will render any tax opinion or advice with respect to the offering of the Q2 Tokens. Accordingly, each Purchaser should discuss the tax considerations of an investment in the Q2 Tokens as it relates to him or her with his or her own tax advisor. Regulatory risks associated with the issuerÕs operation, with the potential treatment of digital assets as securities, and with unforeseen legal restrictions on debt repayments using digital assets is a novel legal construct. The Offering is an offering of debt securities by a non-investment service company under Regulation Crowdfunding. However, there is a regulatory risk associated with (i) the offering registration and exemption eligibility; (ii) redistribution of any assets that constitute securities; (iii) any activities that are deemed investment activities, investment advisory activities, and/or brokering or dealing activities by the issuer. Operating and legal expenses incurred by the Company to address, challenge and resolve any unfavorable regulatory position may be substantial and may result in the CompanyÕs insolvency. Digital tokens and currencies may meet the definition of securities under U.S. securities law depending on specific facts pertaining to the relevant blockchain project and token uses. There is a risk that the Q2 Tokens useable to repay the debt obligations under the terms of the Offering constitutes securities, in which case the Company and its affiliates and partners may be restricted or even prohibited from delivering or facilitating the relevant token repayments. Purchasers should carefully consult regulatory guidelines on cryptocurrencies and crypto investing prior to participating in this offering. In addition to the risks listed above, businesses are often subject to risks not foreseen or fully appreciated by the management. It is not possible to foresee all risks that may affect us. Moreover, the Company cannot predict whether the Company will successfully effectuate the CompanyÕs current business plan. Each prospective Purchaser is encouraged to carefully analyze the risks and merits of an investment in the Securities and should take into consideration when making such analysis, among other, the Risk Factors discussed above. In addition to the risks listed above, businesses are often subject to risks not foreseen or fully appreciated by the management. It is not possible to foresee all risks that may affect us. Moreover, the Company cannot predict whether the Company will successfully effectuate the CompanyÕs current business plan. Each prospective Purchaser is encouraged to carefully analyze the risks and merits of an investment in the Securities and should take into consideration when making such analysis, among other, the Risk Factors discussed above. THE SECURITIES OFFERED INVOLVE A HIGH DEGREE OF RISK AND MAY RESULT IN THE LOSS OF YOUR ENTIRE INVESTMENT. ANY PERSON CONSIDERING THE PURCHASE OF THESE SECURITIES SHOULD BE AWARE OF THESE AND OTHER FACTORS SET FORTH IN THIS FORM C AND SHOULD CONSULT WITH HIS OR HER LEGAL, TAX AND FINANCIAL ADVISORS PRIOR TO MAKING AN INVESTMENT IN THE SECURITIES. THE SECURITIES SHOULD ONLY BE PURCHASED BY PERSONS WHO CAN AFFORD TO LOSE ALL OF THEIR INVESTMENT. I believe in the concept and realize how popular it is; however I'm not into gaming myself. I just like the business plan. I like the concept of this and believe wholeheartedly that this is a movement in both the gaming industry and cryptocurrency. I believe in Team Weiksner and I think this is a simple, logical solution for an obvious problem. This company is going far. Its concept is ground-breaking. It makes common sense to have a product like this. Because of the enormous potential of the online gaming industry and the company's focus on developers. The investment advisory service of which I am a member has strongly recommended to me. I love crypto & games, and have lost many game tokens over the years! Great idea that I can't wait to see come to fruition. I believe Quarters will be a legitimate and welcomed service for gamers, as well as a rewarding investment in the crypto space! I invested because I believe in the future potential of Quarters. Quarters has an excellent team tackling a real problem. I'm excited to help them break down silos across games! Forward thinking solution and incorporates new digital coin technology. I believe in the company to chance how game currency can now be transferred. I like online gaming, think there is a future in it, and wanted to try republic. I believe block chain is the future and hand held and VR tech is the next boom. Furthering the adoption of crypto. Like the concept of exchange tokens across different games. I'm not a gamer but this startup idea makes perfect sense for those who are gamers. Video games aren't going anywhere. Gaming is always going to expand. Being the first crypto that can be exchanged between platforms, if done right, will be valuable in a few years. So long the games are replayable! I like the idea. My sons are gamers and they will appreciate dad jumping in. I invested because gaming and playing games via Quarters makes perfect sense. Millions play games everyday for money fun and the thrill of just playing. I am investing in an area my son finds very interesting. This is for him. I hope that he gains from this investment. Very interesting and it could be a game changer if done right. Perfect timing! I like the platform idea. I've been following the Quarters story for some time and am very excited about what they're working on! I saw potential and an opportunity on this idea, the research says it all and with a team like this one Ive never felt more comfortable. I want to educate myself in the world of financing and investing and that includes risks that can go right, and that can go wrong. The kid makes sense, I see what he’s going for and I like it. This sounds like a great idea. My kids are gamers! I invested $100.00 because gaming is a great pastime for many people and I enjoy investing! This can turn the gaming industry upside down. Awesome concept! I am a gamer and I do buy virtual coins but once I stop playing I lose it all so I think this is a great idea to allow gamers to transfer their coins to other games. I believe the gaming industry + Blockchain may be huge. Why not take a little shot. Good Luck! I'm not a gamer personally, but I know plenty of people who are and are very passionate about gaming. This has clearly been a rapidly growing sector and it seems the idea and concept are very sound. I believe in the value proposition of the business and look forward to the vision being realised.